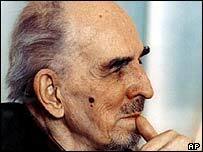 Legendary Swedish movie director Ingmar Bergman, known for his gloomy works, has admitted he cannot watch his films because they make him depressed. "I don't watch my own films very often. I become so jittery and ready to cry... and miserable. I think it's awful," he said in a rare interview on Swedish TV. Bergman, 85, is considered one of the most influential directors in history. His 60-year career has spanned intense classics like Cries & Whispers, The Seventh Seal and Wild Strawberries. He has been nominated for nine Oscars himself, while his films have won Oscars won best foreign film three times.